Brit Marling first met Mike Cahill while attending Georgetown. One of Mike’s short films won the Georgetown Film Festival. Brit saw it, introduced herself and soon began appearing in Mike’s other shorts. It’s been a good working relationship: Brit stars, Mike directs, and together they collaborate on the screenplays. After playing a few rounds of Chicago geography with the Winnetka, Illinois native, we set about discussing Another Earth. Brit stars as Rhoda, a privileged college student who, while driving home drunk after a party, first spots a parallel universe known as Earth 2 through her moon roof. The subsequent crash she causes claims the lives of a prominent professor’s family. Science fiction isn't the only genre Another Earth touches upon. Turns out this is as much a contemplation on the existence of parallel universes as it is a romantic melodrama about a man who mistakenly falls in love with the killer of his family. It’s a powerhouse performance, not a shred of self-pity, with much of the film carried silently in her eyes. Expect great things from Brit Marling. 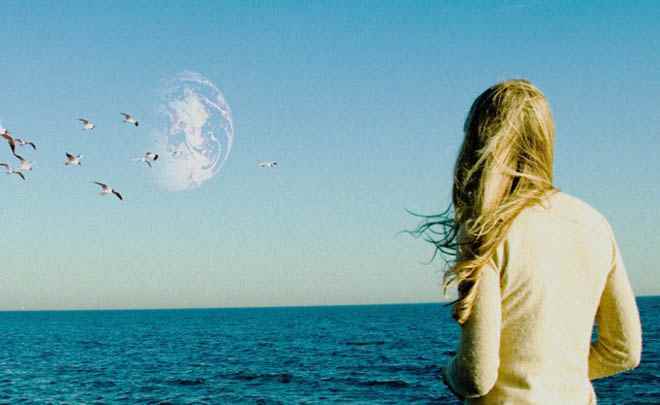 Another Earth opens Friday, August 5 at Landmark’s Hillcrest Cinemas. Scott Marks: How different would the film have been had Rhoda and John (William Mapother) not fallen in love? Brit Marling: That’s a really good question. Maybe it wouldn’t. What if she had just been cleaning his house and they never had a romance? After all, she did accidentally kill his family. The tension is already there. I think there is something about their romance that brings them back into their bodies. Sometimes in the wake of an extreme tragedy, you sort of leave yourself in a way. Things shut down and your senses become muted. There’s this cocooning-in or deadening to the world, because you don’t want to be moved anymore. I think that’s why the love story is important. Love is the moment where you open yourself up and you’re taking the risk of letting someone else see you emotionally. It’s that risk of being hurt. At the end of the film -- on second thought, we probably shouldn't talk about the end of the film too much. Had there been no romance, I do not think the way in which John or Rhoda heal one another would have been possible. At the end of the film they have awakened in one another the ability to love someone else again. I am tired of screenwriters who tack on love stories because they think romance automatically indicates a wider box office appeal. It’s so meaningless. But a friendship wouldn’t have worked in this instance. A friendship is in the realm of safety. You have to deliberately experience the unsafe space of love or romance in order to begin feeling again. Rhoda enters an Internet contest and winds up winning an all-expense paid journey to Earth 2. She is told that being a felon makes her an ideal candidate for the trip. How did you arrive at that? What she is saying there is, prior to the accident, life had been kind and somewhat easy on her. She had a positive experience within the social system, within the financial world, and all of it had seemed rosy. She didn’t seek or need too much from outside of it. But there is something about the outcasts, and the renegades, and the ex-convicts, and the orphans, and anyone who has had an experience that thrust them outside of the pale of the easier, more comfortable life. It can awaken inside a kind of courageousness or a spirit of adventure, (making one) eager to throw a bit of caution to the wind while seeking something else that is outside. Either because you gained entry to the “inner-circle” or you’ve been kicked out of it. Whatever it is, you are willing to live a more uncomfortable, even more courageous life. It’s the perfect, perhaps the only logical way to end the film, but something tells me the last shot was not in place from the get-go. At what point during the writing of the screenplay did you and Mike Cahill come up with that curtain shot? What started the movie was the idea of the doppelganger and the idea of everybody here being able to confront themselves there. Then we backtracked our way into a human story we could tell at the center of this ambitious sci-fi movie. We didn’t come up with the ending until we knew we had a film. It actually started as a series of three sci-fi short films and Another Earth was just one of them. The idea was to have the same actress star in all three of them. The story became so rich that when we came up with the end, we ran around Mike’s apartment screaming at the top of out lungs. We were so excited. I think a film is just its ending. That’s all that it is. You surrender to a filmmaker’s point-of-view, waiting for that last moment to make you feel and hopefully give you some insight you hadn’t had before. Have you seen 12 Monkeys? (Grumbling): You mean the remake of Chris Marker’s La Jetée? I like Terry Gilliam, but what’s the point of taking a flawless 28-minute short and padding it to feature-length proportions without much in the way of improvement? 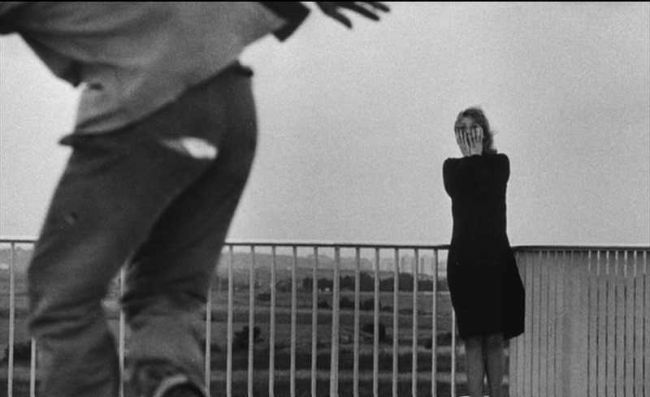 I love La Jetée, too, and it is always tricky when you’re taking an original work and adapting it. But that ending moment in the short, first and foremost, and also in the other version -- I got something. That told me something about mortality and the end of innocence that I did not know before. Those are the kinds of movies that interest me the most. I’m not the world’s biggest fan of science fiction. Too often unimaginative filmmakers fail to establish a set of logical ground rules before setting their fantasy universes in motion. Not so Marling and Cahill! Budgeted at under $100,000, you couldn’t afford CG monsters or special effects. If you don’t have the resources needed to pull off elaborate effects, simply streamline the bulky exposition and have it delivered via television and radio broadcasts. Your handling of the fantasy elements was so refreshing. In its own way, shouldn’t Earth 2 share the blame with Rhoda’s drinking for the death of John’s family? (Lowering her voice): I think so. (Laughing.) The story sort of punishes Rhoda for her romantic innocence. She’s acting reckless in that moment, for sure, but she’s also being a bit of a daydreamer and she gets punished for it. Nowadays, if a character drinks or takes a hit off a joint in reel one, they are either punished for it, or worse, by reel five. This worked because you didn’t drag out her addictive behavior and turn it into a Public Service Announcement. At this point in the interview, the Popeye in me begins to stir. I've had all I can stand, I can't stands no more and break down and admit how much lovelier she looks in person and out of character. Her eyes begin to tear up a bit. I’ve made women cry before, but never in public. (Laughing). If you start going soft on me, I’m outta' here. I’m not. It’s just that I’m amazed. You’re obviously somebody who watches all of the great movies. It’s probably not an easy thing to move you. Are you kidding? Throw the cat out of the cab at the end of Breakfast at Tiffany’s and I go all Jell-O inside. Your first time out of the gate and your feature is picked up by Fox Searchlight. And from what I gather you have another film in the works. You’re doing intelligent work. While you may physically fit the bill, I’ll be very disappointed to see you assume the Blake Lively role in Green Lantern 4.
Who am I kidding? If they offer you Green Lantern money, take it and turn the profits into a hundred indie pictures. Thanks for coming to San Diego. Hope to see you back with Sound of My Voice.